Here’s another way to use the leftover lees from making soya bean milk, as well as a way to work with alternatives to wheat flour. This recipe from Shurtleff’s Book of Tofu doesn’t do away with wheat flour entirely, though, so it’s more for those who are interested in some degree of food rotation rather than those with a true wheat intolerance problem. 1) Sift together dry ingredients. 2) Beat egg yolks, then combine with okara, honey and vanilla. 3) Stir dry ingredients into egg-okara mixture. 4) Whisk egg whites till stiff peaks form. Fold gently into the rest of the mixture. 5) Spoon into lightly oiled pan and bake at 200°C. If making cupcakes, they will take at least 20mins or until toothpick comes out clean. The high temperature gives a strong browning effect to the cake. You can see I made this into cupcakes, which is what I normally do with cake recipes. It’s easy to freeze the batch and take out one or two for a snack bento. I usually wrap them individually in paper towels which soak up any moisture from defrosting cakes, and also help to keep them from drying out should I decide to microwave them before eating. Most of the time though, cupcakes and muffins which defrost on their own inside my snackbox taste great without any microwaving at the time of eating. Next time, I won’t use paper casings. As there’s no fats in this cake, it sticks like crazy to the paper :P.
The texture is distinctive, more bouncy than normal cakes and also light and airy. It reminds me of some Chinese New Year mini sponge cake. Perhaps this is the kind of texture that’s created when no fats are used. It’s also flavourful without being sweet. A good change from same old muffins in my snack bento. Here’s my first experiment with non-wheat flour. It really doesn’t taste very different, but that’s because spelt is actually a variety of wheat. Even if you don’t have an outright wheat intolerance problem, food rotation is a good idea. Spelt is not gluten-free so there really was no need for the last book, but it was still interesting to note the spices, raisins and nuts as well as orange juice used as milk replacement in the recipe (no citrus juices in large quantities for me – high in salicylates). Both the vegetarian and gluten-free books’ muffin recipes use buttermilk or yoghurt, and I’ve found I prefer the texture from this mix than the old recipe I was using. I also use 2 eggs now instead of the 1 egg I did before. The Ayurvedic book also melted ghee, butter or oil interchangeably for muffins, so I opened the first tin of ghee I’ve ever used ☺. I already had it sitting in the cupboard, waiting to be experimented with. For the flour mix, you can replace up to half a cup out of a total of two cups with alternative non-gluten flours. You don’t need any sugar as the pumpkin, raisins and walnuts give this plenty of flavour. 1) Sift together dry ingredients. This is important to combine the leavening agents and flours properly. If they are not evenly mixed, there will be large holes in your muffins. I often have a problem sifting wholegrain flours with leavening agents because the large flakes in wholegrain flour don’t go through the sieve and I can’t get at the smaller clumps of baking powder/soda to break them up and press them through the mesh. Right now, I’m trying to get round the problem by using my sieve which has a coarser mesh. 2) Mix wet ingredients together. Put the eggs in last, because if you mix raw eggs with hot melted butter you will get cooked egg (yes, this happened to me before!). 3) Mix the pumpkin puree thoroughly with the wet ingredients. I like to use a whisk for the wet ingredients. 4) Coat the raisins and nuts with flour to prevent them from sinking in the batter whilst baking. 5) Mix all the dry ingredients into the wet ingredients all at once quickly and lightly with just a few strokes. It’s ok if there mixture is clumpy. 6) Mix in the raisins & nuts. 7) Put into greased muffin tins. Paper casing is unnecessary. I have discovered that unless the cake has a high fat content (such as this cake recipe), it will stick to the casing. Pour water into any unused holes in the muffin tin to keep the tin from warping, and to produce steam which helps to create crispy tops on the muffins. 8) Bake at 180°C for at least 20 mins, or until toothpick comes out clean and muffins are fragrant. I often go through phases where I try out several dishes from the same cooking method in order to teach myself new skills through trial and error. Recently, I’ve been doing puddings, which the green tea silken tofu can be considered one type of. However, tofu-making a quite different from custard puddings, which involve gently heating eggs and milk (sometimes cream as well) to set it into a soft, smooth consistency. Crème caramel certainly isn’t healthy or allergy-friendly by any means (fortunately I can tolerate dairy products) but I wanted to make something classic, basic and follow the instructions very precisely in order to become familiar with the cooking technique. First of all, I needed to acquire suitable dishes of the appropriate size that were also oven-safe. Compared to unlabelled ceramic ramekins, Pyrex glassware seemed the most reliable and they sell custard cups in packs of 4 (or individually at Sia Huat). These also make pretty serving dishes and are great for cooking prep too. However, my purchase was initially derailed by a Tangs sales assistant who told me that only Pyrex ‘Bakeware’ range was oven-safe and the custard cups were not part of this series. A check on the Pyrex website showed this information was incorrect and I phoned the Singapore distributor to get a definitive answer. Fortunately I managed to rush back to Tangs in time to take advantage of the 20% discount on Pyrex going on during that period : ). I used the detailed instructions in Baking at Home with The Culinary Institute of America, which turned out extremely well. It says 6 servings, which fit six Pyrex custard cups perfectly. 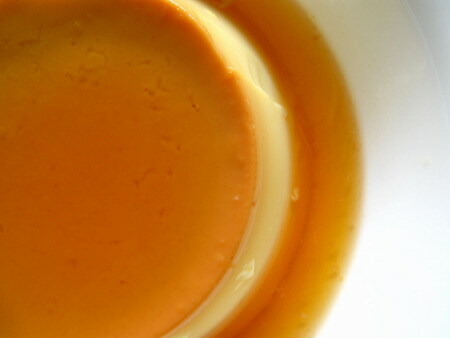 The process of making crème caramel basically involves three important cooking steps, plus a crucial fourth stage of refrigeration for at least 24 hours. Don’t forget to preheat the oven to 325°F/ 160°C — a slow oven. Put sugar and lemon juice in a pot and bring to the boil over high heat. It’s important to keep stirring constantly to prevent the sugar from burning. Once all has melted, stop stirring and begin swirling the pan to cook under the sugar is a rich golden brown, 3-4 minutes. It’s important not to stir the melted sugar or else you will end up with gritty bits that spoilt the texture of the caramel. When caramel has reached the desired colour, add the warm water and stir over low heat until all hard bits are dissolved. Divide the caramel amongst the 6 custard cups. I wonder if I overcooked the caramel as it tasted slightly bitter, or perhaps it was the amount of citric acid (in place of lemon juice) that I used? Combine the milk, 1/4 cup of sugar and the salt in a saucepan over medium heat and bring to a simmer. Be careful not to scorch the milk which will result in it sticking to the bottom of the pan and having a burnt flavour. To avoid this, don’t use too high a heat, keep stirring the milk and use a heavy bottomed-pan. Once the milk starts to simmer, remove from heat and keep warm. Blend the egg and egg yolks with the remaining 1/4 cup sugar in a heatproof bowl. The important thing at this stage is handling the eggs so that they do not get cooked by the hot milk, so temper the eggs by gradually adding the hot milk a little bit at a time and whisking constantly. Then add the vanilla extract. To achieve a fine, uniform smoothness of the custard, strain the mixture through a fine mesh sieve into the prepared custard cups, filling them 3/4 full. Prepare your custard cups by coating lightly with cooking spray or a bit of oil. Place them in a deep baking pan, into which a kitchen towel has been placed over the bottom. Put the baking pan on a pulled-out oven rack. You should have a kettle full of boiling water ready at this point. Add enough boiling water to come halfway up the sides of the custard cups. The kitchen towel will prevent the dishes from sliding around in the water-filled pan. The water bath and the slow oven ensure the custard cooks evenly and smoothly. Here is a photo of my pumpkin custard which I tried to speed up by using ‘Fan Bake’ function — you’ll notice that the top is overcooked, resulting in the uneven texture and it formed a leathery skin o the top compared to the smooth custard below. Hence, slow even cooking is what one is trying to achieve with puddings. Slide the rack back into the oven and bake for for 20-25 mins until the edges have set and a coin-sized spot in the centre jiggles slightly when a custard is shaken. I had some difficulty interpreting this instruction so I relied on a bit of intelligent guesswork to figure out if the custard was ready. Remove the custards from the water bath; you might like to use a pair of tongs to remove them; tongs with slip-proof silicon tips would be great. Let the custards cool on a wire rack, wrap individually then refrigerate for at least 24 hours or up to 3 days. I have kept custards in the fridge for longer than that, and after day 4, there is a distinct drop on taste and texture. The 24-hour resting period is required for the custard to cool and become firm enough to unmould, and for the caramel sauce beneath needs time to reabsorb some moisture and turn into a liquid. To serve, warm a sharp knife in warm water and run around the edges of each cup. Turn the custards out onto chilled plates. I’ve realised it’s time to face up to my less-serious intolerances, the ones that don’t make me obviously ill but also keep me from being in top form. Chocolate is one of these *sob* but quite an easy one to avoid. The more difficult one is wheat because it is used so heavily in baked goods. I have already purchased some wholegrain spelt flour to see if it works well for me in my next round of baking and will finally begin look more closely at other alternative flours. On the one hand, I feel tired at having to learning about new baking ingredients but trying to look on the positive side, it’s also an opportunity to expand my knowledge and improve my baking skills. Quite by chance, I made some pleasant discoveries whilst shopping in Carrefour. The first was buckwheat crepes, a traditional staple in Brittany and Normandy, which are called galettes, from the premium in-house Reflets de France range. It was great to note that there were no nasty additives in the ingredients list. These aren’t cheap at more than S$1 a piece (pack of 6) but I’m tempted to get some to see how my own homemade version compares. While the buckwheat crepes were huge, a small pack of organic wholegrain spelt waffles from UK brand, Dove’s Farm, costs just as much. Nevertheless, it was a great to see these organic non-wheat options right there on the shelves of a mainstream supermarket chain. N.B. : Spelt is an ancient variety of wheat which is tolerated by some – not all – wheat-intolerant individuals. It is not gluten-free. 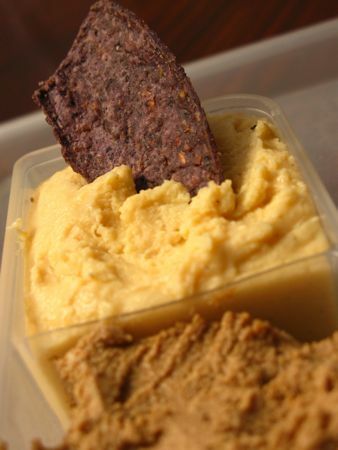 Blue corn tortilla chips with red lentil dip (top) and hummus (bottom). My first encounter with hummus was when I started on the anti-candida diet and found hummus inside Xandria William’s Overcoming Candida cookbook. Recently, I’ve also seen hummus variations (no tahini, no olive oil) in Sue Dengate’s Failsafe Cookbook. It’s a dish that you can easily adapt to your own taste and desired consistency, so the recipes don’t need to be followed exactly at all. 1) Chickpeas — canned or cook your own from dried chickpeas. If cooking, soak them overnight (they will swell considerably), change the water, then bring to a boil and simmer, scooping away the froth. Cook for 1 1/2 to 2 hrs, or until soft enough to crush easily. Save the cooking liquid for pulverising stage. 2) Garlic. To taste. Xandria William’s recipe uses 2 cloves to 450g of dried chickpeas, whereas Sue Dengate’s uses 2 cloves to one 440g tin of cooked chickpeas! 3) Oil. For best flavour, use olive oil. But olive oil is also high in salicylates, so choose a failsafe oil if you need to (sunflower, safflower, canola, and most failsafers can also tolerate rice bran). My take on oil is also to avoid GMO foods if you can. 4) Tahini. To taste. Sesame seeds are high in salicylates, so omit tahini completely if you have to. If using tahini, do stir in the oil floating at the top properly first. In the photo above, the hummus looks very dark because I used tahini made from unhulled sesame seeds. This kind of tahini also has a stronger nutty taste. 5) A tangy flavour. To taste. Traditionally, it’s lemon juice, but again lemons are high in salicylates, so use the standard failsafe substitute – citric acid dissolved in a bit of water. Usually 1/4 tsp will be enough to produce the equivalent of a couple of tablespoons of lemon juice. 7) Parsley, chopped. To taste. Put all into a food processor and blend till smooth. Adding as much oil and chickpea liquid until you get the desired consistency. a) a dip for my favourite Kettle’s organic blue corn or multigrain tortilla chips (shown in photo). They work out cheaper than Kettle’s non-organic potato chips even, and the blue corn chips are barely salted – fabulous! Food sensitive failsafe eaters will know that Kettle’s chips are better-tolerated than other commercial brands, which I myself have also personally experienced. b) a spread for sandwiches, which can be combined with other sandwich fillings like roast chicken, roasted vegetables or salad. Readers here will know I love drinking tea and that English-style afternoon teas play an important role in my life. As I mentioned earlier, my secret to a successful English afternoon tea is Marks & Spencer’s tea. M&S Singapore is currently selling organic tea at S$6.50, down from the regular price of S$9.90, for the pack of 80 tea bags. M&S red label tea is also reduced to S$4.90 for 80 tea bags. This compares extremely well with regular supermarket teas which are generally sold in boxes of 20 teabags. The M&S tea bags are packed in vacuum-sealed foil packs of 40 bags each. Both the organic and red label teas are medium strength and a blend of East African and Indian teas. Expiry is end March 2009. Following my attempt at making firm tofu using nigari as a coagulant, I picked up some Glucono-Delta Lactone (GDL) coagulant at Phoon Huat and decided to give this dessert-style tofu pudding (a.k.a. 豆花 douhua/tau huay/ tau foo fah) a go. GDL is thought to be a more healthy coagulant compared to inorganic calcium compounds. Unlike moulded tofu, silken tofu doesn’t require any special container and produces a greater volume of tofu in relation to the amount of soya milk used. Typically, it takes less than an hour to be ready for serving. [GDL is] an organic acid that solidifies soymilk in much the same was that lactic acid or a yoghurt starter is used to curdle dairy milk. A newly discovered solidifier made from natural gluconic acid, lactone makes it possible for the first time to solidify very thin soymilk, and even cold soymilk, by simply heating it to somewhat below the boiling point. 1) First, I began by making soya bean milk and measured out 3 1/4 cups whilst it was still hot. 2) Mixed in 1 Tbs green tea matcha powder and 3 Tbs sugar. As matcha often clumps up, it helps to sift it into the milk and use a whisk to make sure it is thoroughly incorporated. 3) Dissolved the 1 tsp lactone in 2 Tbs of water. 4) Poured the lactone solution into the soya bean milk, whilst gently stirring. 5) I made individual portions by dividing the still liquid soya bean milk into 6 custard cups. You can also leave the tofu to set inside a single pot. There is no separation of curds and whey, unlike the other method of making firm tofu. 6) The Book of Tofu says to let the soya milk stand uncovered for half an hour while it cools and sets, then cover with cling film and refrigerate. I made the mistake of covering the custard cups with cling film right away, and ended up with condensation on the inside. Verdict: compared to commercially prepared tofu, mine definitely tasted like an amateur’s attempt. The texture, while very light and soft, could have been smoother. There was also a faint sour taste The green tea flavour was quite subtle, and the amount of sugar was just nice – I wonder what it would have tasted like without any sugar at all? Anyhow, this is definitely worth another try. The Book of Tofu says that nigari makes the most delicate and delicious silken tofu, so I may use that alternative the next time. Making tofu at home P.S.